Competition: What’s your Angel Addiction? Have you caught the latest campaign for Thierry Mugler’s iconic Angel perfume? The exceptional Georgia May Jagger stars in the campaign, which explores the addictive universe of Angel, described as “a fascinating world made of dreams, imaginary journeys, sweets and sensual delights”. As an Angel wearer, I can totally vouch for the evocative nature of the perfume,; vanilla, chocolate and patchouli base notes make for a sensual and potent scent. Recently, the team at Thierry Mugler approached me to share my most cherished addictions as part of the Angel Addiction campaign. To me, addictions can either be short-lived, heady and intense or more long term, spanning years. I want to share a few of my own addictions with you and would love to hear yours too! 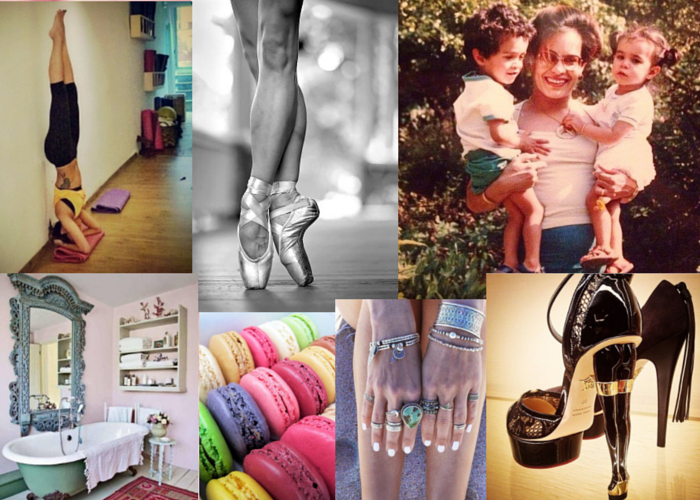 My earliest addiction was ballet. I started lessons when I was 3 and carried on for about a decade. I went to class religiously, practised hard and passed my exams with flying colours. I’ve recently picked this addiction up again, though not quite with the same determination and ferocity. My second addiction is family. Simply put, I wouldn’t be me without them. Although we’re spread across the globe, we speak so frequently that we don’t really feel the distance. My third addiction is sleep followed closely by bubble baths, between working, blogging, working out and travel I tend to burn the candle at both ends so pampering is very necessary, especially weekend lie ins. Macaroons are irresistible little bites of deliciousness that you can’t help but become addicted to. Laduree do the best macaroons in London but when I’m in Paris I head straight to Pierre Herme. Thankfully my yoga addiction cancels out the macaroon addiction! When it comes to fashion addictions, mine are definitely shoes and jewellery. Give a girl the right shoes and she can conquer the world. Add a sprinkling of jewels and she’s an unstoppable force. Fashion has the power to change how you feel, the right heels make me walk taller and with more purpose. I hope you’ve enjoyed reading about my addictions. I have a special competition to win a full size bottle of Thierry Mugler Angel, just share your #AngelAddiction as a blog comment or on Twitter or Instagram. Make sure you include the hashtag #AngelAddiction and @Mugler and @Reena_Rai. The competition closes on Friday 24th October 2014. Follow me on Twitter. Follow me on Instagram. I never tried maccaroons myself.. horrible right! I always look up to ballina's. They are so determined and strong, how amazing that you dance since you were 3!